ON THE SCENE Earns A Gracie Award! ON THE SCENE Wins A Gracie Award! I am proud to announce that ON THE SCENE has been nationally recognized for excellence in entertainment coverage by earning a Gracie Award! The Gracie, named in honor of the late comedienne Gracie Allen, is given annually by the Alliance For Women In Media and recognizes outstanding programming by, for or about women. Our segment “ON THE SCENE: Journey of Love-The Darlene Love Interview” was selected for the award. It’s an interview I vividly remember because I sat down with Ms. Love just days after she discovered her dream of being inducted into the Rock And Roll Hall of Fame was about to come true. It was a pivotal moment and we discussed the many other pivotal moments in her life leading her to this one. Watch this interview on the Credits page of johnbathke.com. 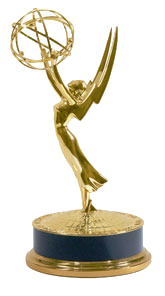 What an incredible week…an Emmy nomination for ON THE SCENE and a Gracie Award. And an astonishing team of television professionals who make it all happen show after show. ON THE SCENE Is Emmy Nominated Once Again! ON THE SCENE Is Headed To The Emmys! It’s time to celebrate! 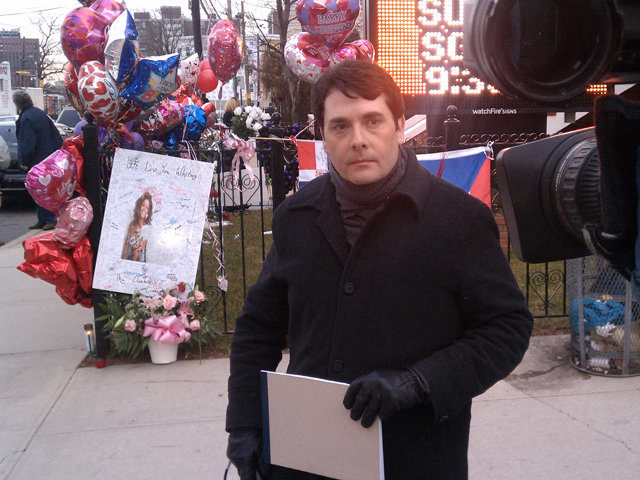 ON THE SCENE received a New York Emmy Award nomination for coverage of the arts. The piece selected for this honor by the National Academy of Television Arts and Sciences is entitled “Through Bojana’s Eyes” and you can watch it on the Credits Page of johnbathke.com. It chronicles how painting helped bring artist Bojana Coklyat back from the brink of death. As promised, we’ve posted my ON THE SCENE segment about the production of “Red” at George Street Playhouse, featuring interviews with actors Bob Ari and Randy Harrison. I have spent this week covering the death of Whitney Houston from her hometown of Newark, New Jersey, which is next door to the city where she grew up, East Orange. Here I am getting ready for a live report from New Hope Baptist Church where her funeral will take place. This is where it all began for Houston singing in the church choir. Thanks for the emails, unprecedented number of blog views, kind words and inquiries about last weekend’s ON THE SCENE featuring Peter Max and the cast of “Red-” Bob Ari and Randy Harrison. This episode was spectacular in high definition…the vibrant paintings of Peter Max and that splattering crimson paint flinging across the set in “Red” lit up the screen. (No wonder Randy Harrison thought his famously blond hair would turn red by the end of the play’s run). Oh yeah, the host didn’t look bad, either, but I am hopelessly biased! I see that a number of viewers who are interested in Peter Max are coming to my blog after watching ON THE SCENE. So I thought I’d just say a couple words more about interviewing him. I’ve heard from artists in particular who watched and love how he describes his work process…that he has no idea what he’s going to paint when he starts a fresh canvas and it reveals itself to him as he goes. I also am fascinated by the connection between his paintings and his musical inspirations. He likens his paintings to a jazz musician building on a riff and before the musician knows it, there’s a composition. But just what it means may not be immediately clear. After Max told me that I saw his paintings through a new prism…as colorful jazz flourishes and improvisations. Our interview also touches on the beginnings of his artistic life as a small child living in China, where his father was in business. Max started drawing because his “little Chinese friends” all drew with chalk, so he joined them. Anyone who’s ever met Peter Max never forgets him and this is an interview that I treasure. And I always say that every artist who I interview becomes a part of me and I carry their influence with me in some way, always. With Peter Max, it’s the power of positive energy, to find it in others and in myself, and share it with the world. Like the biggest, brightest canvas one can paint. You are currently browsing the John Bathke's Blog blog archives for February, 2012.